Torrential rains, heavy snow, high winds and hail have swept across the Middle East, exacerbating the already precarious living conditions of tens of thousands of Syrian refugees, many in camps and informal settlements. Storm Huda has caused significant damage to shelters and infrastructure in Za’atari refugee camp, where REACH teams are supporting humanitarian partners to map the damage and ensure a coordinated response. 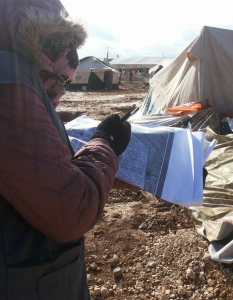 Severe weather conditions made access to the camp difficult, leaving many humanitarian actors unaware of the true extent of damage in Za’atari until publication of the first map on January 9th. This map compiled available information about flooding, blocked roads, and areas of significant shelter damage in Za’atari. The exercise highlighted the critical situation of refugees living in canvas tents, around 20% of the 84,729 Syrian refugees registered in the camp, which have been most heavily affected by the storm. Some shelters had been blown away by the high winds, and others completely destroyed. The first map was used immediately as a baseline for further data collection. REACH distributed maps to all humanitarian actors in the camp, who added their own observations and updates as they worked to repair tents, pump water away from flooded areas and de-sludge WASH facilities. The latest updates were compiled into a second map, released on January 11th, which provided partners with up to date information on remaining needs and gaps. In order to avoid the duplication of information, each partner organization was assigned different districts in which to continue data collection. In the coming days, REACH will continue to map the impact of this coordinated intervention to respond to storm damage. The latest map is available here, and updated information will be mapped as soon as this becomes available. All maps, reports and factsheets for the refugee response in Jordan can be found on the REACH Resource Centre.